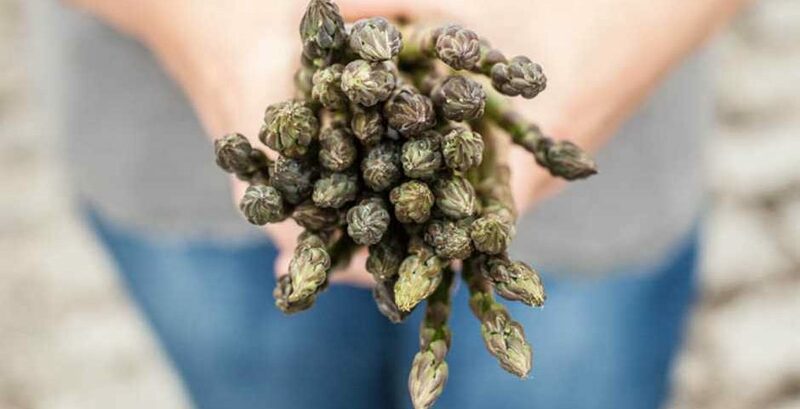 Eagerly anticipated, the coming of the asparagus season is one of the sure signs that summer is on the way. These succulent stems start to appear as the weather warms in late April, although here in Cornwall they’ve been known to arrive as early as March. Our benevolent climate and sea air is just what these warmth-loving, salt tolerant plants adore. Asparagus is picked for a strictly limited period of six to eight weeks. Extending the season is counter-productive as it simply deprives the crowns of their sustenance and produces a lower yield the following year. Taken from: The Great Cornish Food Book (available to buy in store at £17.99). Asparagus is now available to buy in store – from Splatteridden, Lelant Downs at £3.99 a bunch.